Seth Kugel for The New York Times Bath Beach at sunrise. 1) Drink tap water instead of bottled; it’s safe. Seth Kugel for The New York Times A bus stop on the island’s eastern shore. 2) Take the bus, not a cab, from the airport to your hotel. 3) Avoid paying the cover for live music at McBride’s Pub by befriending the Brazilian women’s boxing team. I admit, the third may not be universally applicable, but it sure saved me some bucks (15 Barbadian dollars, or $7.50 at a simple 2-1 exchange rate), so I’d be remiss in not passing it along. Turns out that my trip coincided with the world championship of women’s boxing, also being held on the easternmost island of the Caribbean. My first night, I spotted three women wearing Brazilian athletic outfits and strolling along the island’s night-life row. I am a big fan – and part-time resident of — Brazil, so I introduced myself and invited them all for a drink. Lest you think that either a) the Brazilian women’s boxing team boozes during tournaments or b) the Frugal Traveler can afford to buy three women a cocktail, let me clarify. First, my new friends Glauce, Clélia and Andréia had already been eliminated from their weight classes. And second, I was taking them to Café Sol, where the two-for-one, 10 p.m.-to-midnight happy hour meant a round would cost a mere 24 Barbadian dollars ($12). So soon we were sipping mediocre, beggars-can’t-be-choosers frozen margaritas, and I was doing what any man surrounded by female Brazilian boxers must: beg for a team T-shirt. Clélia said she had an extra uniform (like the one in the photo accompanying this article), and would bring it to me the next night. She did, I put it on, and we were all waved into the dance party at McBride’s, where a mixed crowd of tourists, Barbadians and Barbadian-American tourists packed the sweaty house. It was a nice change from my trip to slightly stuffy Bermuda. Both had perfect swaths of white sand lapped by brilliantly, pleasantly warm blue waters. 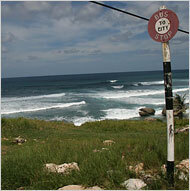 But Barbados also had a vibrant, warm, slightly scruffy local scene to go with them. Add to that the incredible kindness with which this island’s residents — who call themselves Bajans — treat foreigners, and you’ve got one heck of an island. Even its size seems perfect. Shaped like a ham (or, for vegetarians, an off-center pear), Barbados measures about 22 miles from top to bottom and at most 14 miles across – too big to get bored in, too small to get lost in. Upscale resorts dot the western coast, and the bustling southern coast is full of budget hotels and nice – if teeming – beaches. The rest of the island is more raw, more wild. There are empty beaches; former plantation houses; historic parish churches; and small villages largely consisting of what Bajans call chattel houses, tiny old wooden homes, many of which are barely bigger than a small New York City studio apartment. I spent a lot of time in the south, on the beach or at the Gap or eating at good places like Just Grillin’ and Ackee Tree, but I spent more on trips around the island. Buses will get you just about everywhere. Blue public buses, yellow private buses, and private vans are all 1.50 in Barbadian dollars (75 cents) per leg, no matter how far you go. 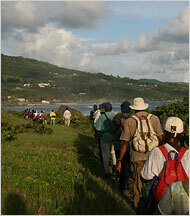 Seth Kugel for The New York Times Hiking with the Barbados National Trust. My favorite spot by far was the sparsely populated east side, where surfers – and few others – flock. I got to see the east side’s other, er, side. I figured an easy way to do so was one of the free weekly hikes run by the Barbados National Trust that start out from a different point of the island each Sunday morning at 6 a.m. That’s how I found myself standing in the Bath Beach parking lot with about 60 or 70 Bajans on my third morning there. (I could spot only one other semi-outsider, a Bajan visiting from New York. ) The trust’s general manager, William Gollop, showed frightening good cheer as he explained that the hikes were available in five levels of difficulty. I joined the second easiest. Make that the fourth hardest. We set off down a sometimes grassy, sometimes wooded trail that hugged the rocky coastline at a pace I associated more with speed walking than hiking. But the terrain was flat, and I kept up as we ducked under branches, swashbuckled through high grass and admired the crashing waves against rocks below. It was when we cut inland and sharply uphill into the woods that I began to suffer. Pretty soon my heart was beating so hard that it upped the intensity of the pounding in my skull. Note to self: next time you are going hiking at 6 a.m., lay off the Mount Gay Rum on the rocks at Sweet Potatoes’ Latin night the previous evening. The leaders of the hike felt my pain, though, and swung into be-kind-to-tourists mode. When I had to stop and catch my breath a few times, someone always waited with me, never remarking that several young children had passed me by. When I finally reached the top of the hill – after a final narrow, steep and tortuous passage between two rocks that required you to pull yourself up by vine, I was rewarded with a view of the coastline below, and a long, easy trip down. Seth Kugel for The New York Times A view of the coastline. Seth Kugel for The New York Times Near Bathsheba Beach. After we finished the hike – at barely 9 a.m. — I downed two snow cones (1.50 Barbadian from a woman who drives her snow cone truck to meet the hikers’ finish every week), and Mr. Gollop was kind enough to give me a ride to Bathsheba, the main town on the east side of the island. I headed straight for the beach, where a swim and a nap were in order. The surf was fierce, in some spots crashing just offshore into dramatic rock formations carved by waves over the millennia. But there were other places to take a dip, and a handful of Bajans were taking advantage as I dozed. Seth Kugel for The New York Times The view from the Round House Inn, in Bathsheba. 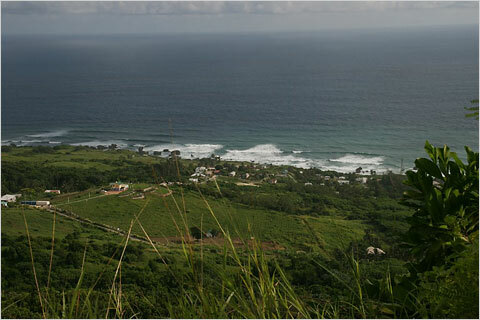 Everyone I met in Bathsheba recommended that I eat lunch at the Round House Inn up the hill above the beach. I landed a choice table with a view of the water and ordered pork chops in Bajan barbecue sauce, macaroni pie, salad and a spiked rum punch. Cost? Fifty-six Barbadian dollars, which I justified under the you-deserve-it-after-a-tortuous-hike clause of the Frugal Traveler unwritten contract. I ended the day with a walk (uphill, argh) to the Andromeda Botanic Gardens: nice, but no better than the free fruit-tree-tour I had gotten that morning from Roslyn. One other worthwhile daytrip was to Speightstown, a slow-going historic port town on the northwest coast with little to do but walk around and enjoy the atmosphere – including a drink at a traditional Bajan rum house called Val’s Hideaway, housed in a chattel house on Mango Lane. I wish I could say there was some great chattel house hostel I stayed in for $10 a night through all this, but such a place does not exist. 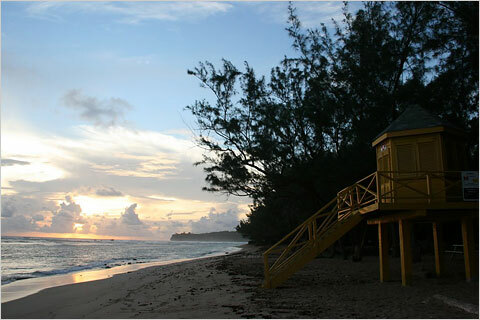 There are two other budget options, however, at slightly different definitions of “budget option.” The Intimate Hotels of Barbados site offers loads of hotels for under $100 a night, one of which was the Pirate’s Inn. The price listed on the Web site is 167.44 Barbadian dollars ($83.72) plus taxes, but when I called to reserve by phone and asked for their cheapest possible price, they offered me the Caricom rate (given to Caribbean residents), a discount of about 10 percent. Seth Kugel for The New York Times Marlin at Oistins Friday night fish-fry. But two days in, I moved to a guesthouse recommended by fellow bearers of the JetBlue All-You-Can-Jet pass, Saska and Paul, whom I met on the bus to the famous Oistins Friday night fish-fry. Over immense plates of marlin, macaroni pie and salad (17 Barbadian dollars, or $8.50) from one of the endless stands serving huge crowds of Bajans and tourists, they shared their find: a guesthouse called Cleverdale, where they were staying for $32 for in double room. I moved in the next day, even though the owner chose to charge me $40. Cleverdale was far from luxurious – it had no air-conditioning and a shared kitchen, for example – but it was perfectly clean and friendly and had a beach view. It was also a 30-second walk away from the object that view, Worthing Beach, a pretty white stretch of sand popular with local families on weekends. Forming a cluster with Cleverdale were two other guest houses that travelers staying there suggested might even be better: Rydal Waters Apartments, and Maraval Guest House. All also had the advantage of being within short walking distance of the St. Lawrence Gap, saving late-night money on cabs home and increasing the odds, however slight, of bumping into the Brazilian women’s boxing team. Our last full day here. I had a lot of trouble sleeping last night. Even with the AC on, I was very hot and I finally got up and rested on the sofa under the fan. I started writing this at 3:30am after tossing and turning. It looked like it rained outside again, otherwise I might have tried to sleep outside. Maybe my non-sleep will make me tired enough to sleep well on the plane on Saturday. Yesterday they had fogged for mosquitos like the do every Tuesday and Thursday evening but last night's seemed heavier than usual. Still, some mosquitos survived and managed to bite me, one on the arch of my foot. I can't imagine he got anything out of my foot. When I woke up at 6am after getting only 2.5 hours of sleep. Tom had opened up and there was a nice breeze. He was off, trying to get sunrise pictures. When he got back, I was sitting with my legs in the pool, trying to cool down the burn from the mosquito bites. They reminded me of a time we had been in Hilton Head and I accidentally stepped into a nest of fire ants. We got yet more pictures from the deck. I saw that heron again but he was still too fast for me. It looks like there's another storm out at sea somewhere. I hope nothing big happens between here and Miami tomorrow while we're flying home. Turns out there was no storm today. The whole day was beautiful. We went over to the Carriage House again for lunch. I got several “heron pictures” but none that really show him/her to best advantage. Yesterday I'd ordered a tossed salad with lunch instead of fries. Fries arrived. Today I figured what the heck and ordered fries. My salad came. Hmmm.. There was another wedding and we got pictures of the setup and all. This one had a steel drummer playing the wedding march. I tried to get a little video but we were too far away. The wedding took abut 5 minutes. The pictures afterward took about 45. At some point, I was resting on my elbows on the side of the pool, just lying still, thinking, and a bird swooped down and touched my chest. I think he was as surprised as I was that I wasn't a fish. This is the last entry until we get home. Tomorrow will be a long, difficult day. We get up and pack, then check out of here by 10. We have to be at the airport by 12:40, then lines for tickets, baggage checks, security, customs, duty-free stuff. Then at Miami we go through immigration, US customs, then wait for several hours until our next plane. We get to DC about 12:35am on Sunday, then get a cab for a 45 minute ride home. Then, sleep! Our son should be there when we get home and that will be so nice. Then, we pick up our dog later on Sunday and...back to real life. Work, doctors, volunteer stuff, medical testing, webwork, house cleaning, laundry, calls to make, emails, rehearsals. Real life. In 50 weeks we'll be back! I'm already counting the days. Not much of interest today. I went over to reception and posted 3 days worth of blog posts and pictures. I haven't found anything yet that can replicate for the Mac what Windows LiveWriter does on my PC. Fortunately, at home. I can stick with the LiveWriter. People called from the spa to offer a 10% discount for any treatment I wanted (or, presumably, any treatment Tom wanted). I guess someone looked at our account and realized that we weren't coming even close to the hold they had put on our debit card and wanted to use a bit more of that money before we left. Around 2:30 we went over the the pool complex for lunch. I took some pictures of the goldfish? Koi? Whatever, there were lots of them, maybe hoping for lunch, too. I saw what looked like a brown heron watching the fish but I think they were too big for him. I saw him or one of his relatives last night but thought that I was mistaken. I don't think that they have herons here. I'll have to look that up. Of course, this one flew away as I was getting my camera out but Tom saw him, too. Around 6pm I finished my 4th book and started on number 5. When we woke up, we could see that it had rained overnight but it was another nice sunny day. Mostly another lazy day that blended into the others. Around noon I finally decided to get the bag I'd been coveting since we got here. I had looked at it 3 times when we were in Cave Shepherd before. Naturally, this time it had been sold. They did have it in another color which I didn't like nearly so much. Tom got another thirt, though! We went swimming in out little pool for a bit, then the rains came. We got lots of pictures. At first, I thought this might be hurricane Fiona but it turned out she was already north of us. This was Tropical Storm 9, now hurricane Gaston. This season has had more hurricanes out to sea than I can remember from any other year. There have been 4 in the 12 days we have been here. Pretty impressive! Someone on StormCarib said that it seemed like Africa was shooting us with fiery cannonballs and I think she was right. When it it was pretty obvious that the rain wasn't letting up anytime soon, I took my shower and resumed reading inside. When the rains stopped, I went back outside to read even with the chairs being wet. Why not? I had just been in the pool and the clothes would be washed anyway. When it got too dark to read, I got some good sunset pictures before coming in to get dressed...again. This time I put on the new island-y dress I had bought last week for only $24 duty free. We stopped over by the big pool again to see if we could see any of the satellites or the Hubble space telescope. Several space objects were supposed to be orbiting around 6:30 but it was too cloudy to see anything. We stopped by the little street market in the village and Tom bought some handmade shoes but wanted then in black so the shoemaker is supposed to deliver them to us on Thursday. I had never known that anyone in Barbados made handmade shoes and I never knew Tom to be interested in any. He also bought some bird made out of a coconut shell for one of his office workers. I'll reserve comment but he was sure she'd like it. We took the coconut-shell bird back home then went back out for our main mission of the evening. Out to dinner at D'Onofrio's again. I had the same thing I had last time – chicken scallopini with lemon sauce. Tom had the veal scallopini with lemon sauce but said that it was tough so he had some of my chicken instead. The restaurant manager took the veal off the bill, even though we hadn't asked, and that was nice. A week from today I'll have to check in at Weight Watchers and I don't think it will be good news. Stopped by the pool again, just in case any of the satellites were late but nothing there. Maybe tomorrow! Today we ran out of milk and the fridge is looking pretty bare so I guess we actually have to go shopping again. But later, much later. Our usual housekeeper, Brenda, came back from a 4-week holiday and it was so nice to see her again. We started the day as usual, my typing away, Tom checking email and we decided to go out to L'Azure for breakfast. They have a really nice buffet-type spread so we got lots of good stuff to eat, with a nice view. When we got back, we found that Brenda had cleaned out or coffee pot, our supply for the day was gone and we hadn't gone shopping yet. Oh, no! I need my coffee and I'll drink day-old, cold, I don't care as long as it's fully caffeinated. Tom managed to get some last coffee out of our container, enough to tide us over a little. I went over to Reception and did my daily email, Facebook, Cushing's news and bios, the usual daily routine here. I saw Mel again from the other day and he actually remembered my name, probably because I'm the only person in Barbados walking around with a laptop all the time. We were going to go to the store but decided to go later (everything in my life is becoming later and later!) and take the opportunity to go in the pool. Tom had a book to exchange so while we were over by the big pool we noticed that no one was in it so we settled into our private space. After reading for a while, we went in and swam for a bit, then went over to the pool complex and tried out a couple of those pools that we hadn't been in yet this year. Pictures were taken. And I finished my third book for this trip. We decided to go back and get to the store. We had decided on the little general store here. Surely they had milk, coffee and spaghetti sauce. The paperwork said they were open until 9, so no rush. We got there just after 7 and they were closed for inventory. There had been no announcement, no sign earlier. Luckily we had the rental car. Otherwise, I guess we'd have had to eat at one of the restaurants. Not a bad thing, but something I like to plan for, to look forward to. So, we went back, got the car keys and headed to Emerald City again. We got more than we would have gotten at the general store and it probably cost less, so it all worked out. This is actually Tuesday now and I didn't write a thing yesterday. It was another of those sloth days, just being, thinking, reading, napping. No serious naps like at home but short ones here and there. We had requested someone come in to fix two of the doors that were sticking due to all the moisture in the air. A very nice Portuguese man named Faroe from Guyana came to do that and Tom spent lots of time talking to him while he worked. Tom actually happened to have a phrasebook of lots of languages, one of them Portuguese, and the man was very thankful when Tom gave that to him. Sometime in the afternoon we decided to go have lunch by the pool so we put our suits on and walked over just to find out that something had happened to the stove and they only had drinks and cold stuff. We went in the pool, read a bit then decided to go to the Manager's Welcome Party we missed last Monday. I went to take a shower and could hear Tom's cellphone ringing in the safe. Apparently, Tom had set his alarm on his phone. When he went to open the safe, it wouldn't open so he called the front desk. I got my shower in before the safe-fixing person arrived. Apparently, it had lost power sometime – maybe when the stove stopped working at the pool? - and it “forgot” our combination. We got to the party about halfway through and talked to some folks. There weren't many staff people that we could see there but a nice woman named Margarita came over and introduced herself. She was the new head of housekeeping, just here 3 weeks and she was anxious to hear from people how things were going. Although she is a Bajan, she has lived in Canada, Florida and Indianapolis. After being in all the snow of Canada and Indianapolis, she wanted to come home. Who can blame her? Margarita had also worked at Sandy Lane but gave most diplomatic answers when I asked which she liked best. Sandy Lane is a huge resort on the West Coast of Barbados which focuses mainly on golf and luxury living. I remember when they were being built, wondering what it would be because the area was so large. One of their claims to fame is that Tiger Woods was married there. This year I saw that they were still featuring his wedding pictures in their ads. I asked Tom if they shouldn't remove these ads since the marriage was in such trouble. Tom said that they weren't divorced yet and still might get back together. That night the divorce was announced. Guess next year Sandy Lane will have different pictures in their ads. Then we talked at great length to Paul's wife and that was nice. I wish I could remember her name. One of the other guests came over to introduce himself and asked where she was from. She said that she lived here and the man asked if she worked here. Embarrassment all around when she said that she and her husband owned the whole kit and caboodle. We stopped by the pool overlooking the sea on the way back and thought that maybe could go to L'Azure for dinner but we weren't wearing “evening attire”. I pointed out that it was evening and we were dressed but we decided that probably wasn't what they meant. We should have done shopping today, but we lazed around too much, so we were out of a lot of stuff. For our exotic dinner we had canned soup and peanut butter sandwiches. Yum! Shopping trip tomorrow for sure. I don't think we even took any pictures today – amazing!